You can try and buy our wines in the vineyard shop. We pride ourselves on producing high quality grapes and wines using traditional sparkling wine methods. We think the results speak for themselves. Alia is built on a simple ethos – It takes time. We make Alia solely from Chardonnay grapes that are given time to reach their full potential before we harvest them. This ensures that Alia will mature into a truly distinctive ‘blanc de blanc’. Light gold. Strong persistent mousse of fine bubbles. Pronounced brioche and slight toast on the nose, with citrus and floral hints. Also light melted butter aroma. The palate has good, firm body with full, rich flavours and balanced acidity. Complex flavours with apple, yellow plums and citrus fruits, good length and a slight biscuity finish. Deliciously refreshing yet rich and complex. A great expression of the Chardonnay grape variety, with a distinctly English edge adding further interest. First class as an apéritif – refreshing, appetizing and interesting. Perfect with the ‘meatier’ types of fish and seafood, such as sea bass, turbot and lobster. Can also accompany some desserts, particularly fruit based tarts and can work well with lemon meringue pie! DWWA Gold award for 2013 vintage in 2017 competition. International Wine Challenge Gold award for 2013 vintage in 2017 competition. DWWA Silver award for 2011 vintage in 2015 competition. Alia is built on a simple ethos – It takes time. We make Alia solely from Chardonnay grapes that are given time to reach their full potential before we harvest them. This ensures that Alia will mature into a truly distinctive ‘blanc de blanc’. Nebula is a meticulous blend of our Pinot Noir, Pinot Meunier and Chardonnay, creating a wine with rich fruit avours, power and nesse. 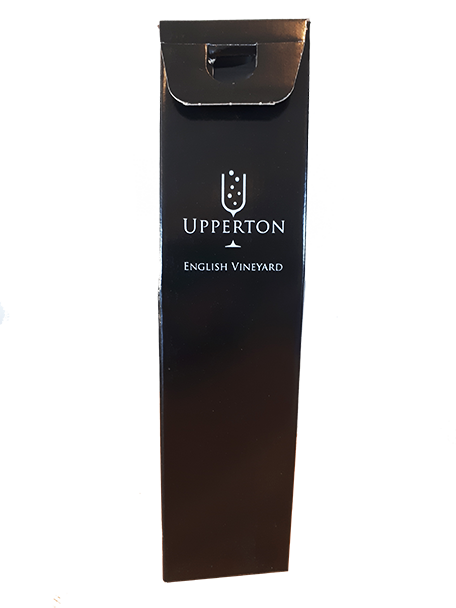 As you experience this exceptional wine, you’ll know how the special surroundings of Upperton Vineyards have left an indelible imprint on its character. Pale gold colour with hints of pink. Fruit on the nose, with apple and peach dominant and aromas of brioche. Palate is crisp, with green apple and citrus notes and a full, refreshing finish. Considerable finesse. Excellent quality English sparkler made with Pinot Noir and Pinot Meunier and Chardonnay. A great wine for apéritifs and receptions, or quietly sipped at any time of day, indoors or outdoors! Bronze award at Decanter 2014. Precision blending gives full expression to the grapes produced in the unique setting, and makes Aurora distinctly special. The imposing strength of Chardonnay is matched by the deep, rich qualities of Pinot Noir and complemented by the soft, gentle warmth of Pinot Meunier. The balance and freshness of Aurora will captivate the senses. Pale lemon colour. Plenty of brioche and toasty aromas on the nose, showing good bottle age and maturity. Melted butter from the high Chardonnay presence. Full bodied with deep mouth-filling flavor. Excellent balance of fruit and acidity. Rich, subtle, rounded character with the depth and elegance of the dominant Chardonnay. Full length with crisp, satisfying finish. A great wine with shellfish and many seafoods, including oysters. The full body and flavour match well with chicken dishes and all white meats. IWSC Silver award for 2013 vintage in 2017 competition. IWSC Silver award for 2010 vintage in 2015 competition. Commendation award at Decanter 2014. Tenebris is born from our superlative Pinot grapes which envelope our exceptional south facing slopes. Being pressed from the black sparkling wine grapes Pinot Noir and Pinot Meunier. Tenebris meaning darkness is the perfect name. The subtle pressing allows little colour to seep through producing a gorgeous white sparkling wine. Rich in flavour with notes of confected cherry and pear drops as well as subtle spices like star anise and liquorice. It’s lively, fine moose and very soft acidity lends it perfectly to Thai food, well aged hard cheese or young cheese. Tenebris is yet to be entered into any competitions. Pinot Noir 85%, Pinot Meunier 15%, 12% Vol, Brut, Product of England. Beautiful crystal champagne flutes branded with the Upperton logo in a branded wooden wine box. 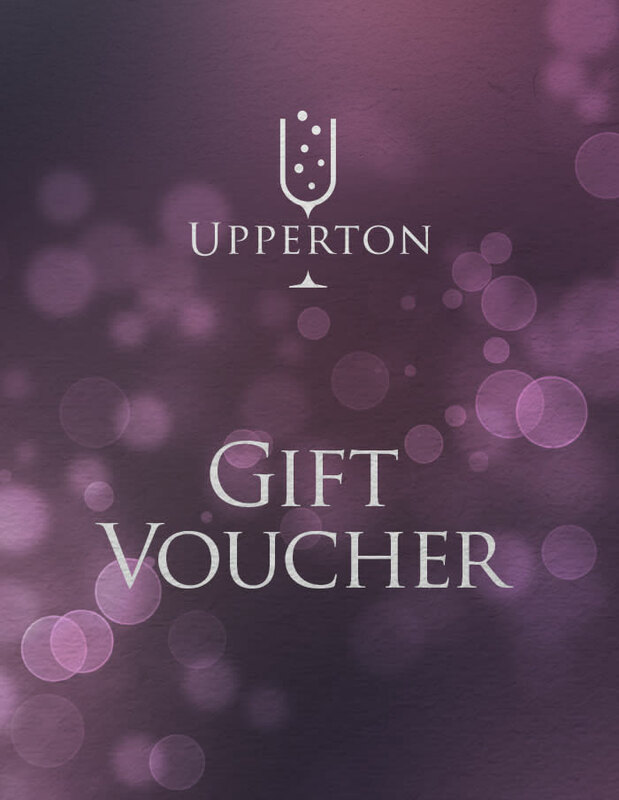 Finish with your choice of Upperton wine. 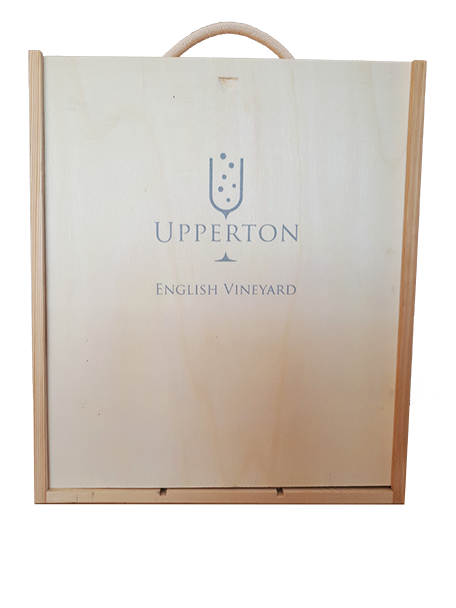 Branded with the Upperton logo this sturdy box fits 3 bottles of Upperton perfectly to make a truly memorable gift. Make your wine gift extra special with a branded wine box. 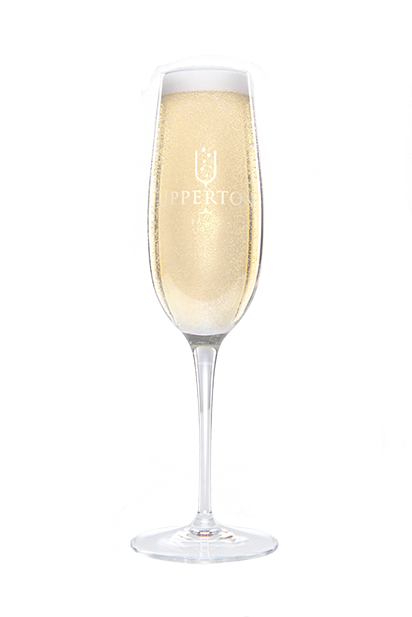 Gorgeous crystal sparkling wine flute branded with Uppertons logo. Perfect for enjoying Upperton bubbles. 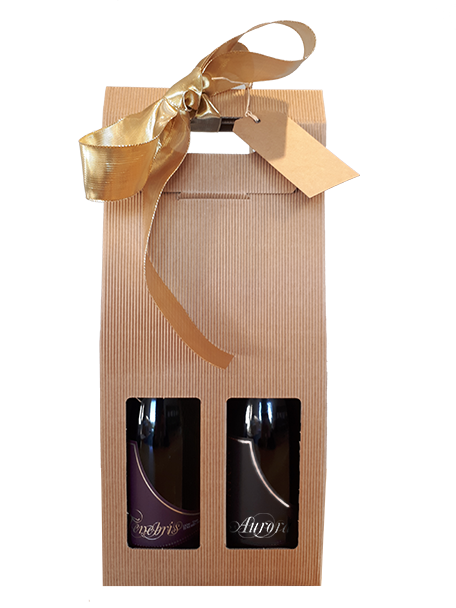 Aurora and Tenebris presented in a smart fluted cardboard wine box with gift tag and bow attached.